As Israelis go the polls on 22 January, Israeli democracy is in real trouble. At least that’s the message from a group of Israeli security mandarins at the centre of the Oscar-nominated documentary film The Gatekeepers. It has long been a truism of the Israeli-Palestinian conflict that it is easier to speak honestly about Israeli repression in Hebrew and in Israel than it is to speak about it in any other language or anywhere else. In recent years, this has become more difficult, as the Israeli government under Prime Minister Benjamin Netanyahu has attempted to suppress domestic opposition. Still, the internal criticism has not gone away. When it is spoken, the truth about the use and abuse of Israeli power in ruling over the Palestinians has tended to draw on two main sources: Palestinian victims, in particular through documentation and campaigning by human rights organisations (both Palestinian and Israeli), and critical, free-thinking writers and journalists in the Israeli media, at times drawing on whistleblowers from within the security establishment. Dror Moreh’s new film The Gatekeepers is very much in the latter tradition. 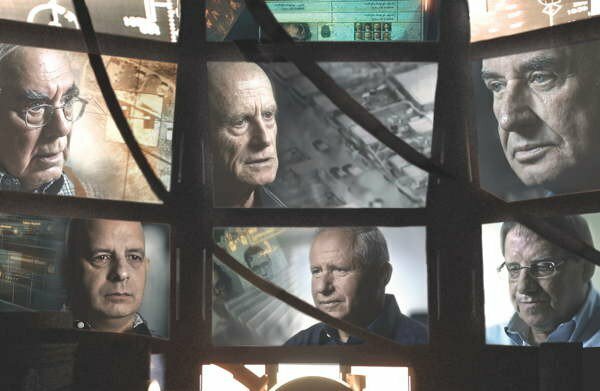 The film is based on interviews with six former heads of Israel’s internal security service, the Shin Bet. For different reasons, most will find this a difficult film to watch: Moreh lets these unrepentant and ruthless pensioners reminisce about the decades-long intelligence wars fought against Palestinian resistance and terrorists - and Israeli terrorists as well - and complain openly about the failures of Israel’s political elites, most notably the Netanyahu governments. The result is that the only good news in this film is also the bad news: the interviews with these architects of occupation confirm that the scope and quality of Israel’s rule over the Palestinians is pretty much as has been described by the human rights organisations and the critical Israeli media for decades. The brutal reality of occupation will not be news to Palestinians of course, nor to the minority of Israelis who have long struggled against their state’s failure to get out of the business of ruling over another people. Neither will the film’s overall message about the conflict surprise anyone: violent conflict with the Palestinians will remain a fact of life until there is an end to occupation; the answer, as it has always been, is to talk. All of those interviewed in one way or another support the idea of a negotiated solution with the Palestinians. For observers of the conflict, The Gatekeepers will be a familiar ritual: top-level current or former Israeli security professionals speaking out about the folly of the government policy vis a vis the Palestinians. For the uninitiated, this may seem more than a little bit discouraging: if the critical voices in Israel consist of security establishment stalwarts, one might be forgiven for wondering about the state of the Israeli democratic opposition. But in Israel’s militarized politics, these voices matter. Their main message is that there is no Israeli political leadership willing or able to deliver Israel’s part in Palestinian self-determination, the inevitable key to any solution to the conflict. The Gatekeepers attempts to explain why. It self-consciously positions these Shin Bet veterans as the latest evidence of the corrupting effects of occupation on Israeli society and politics. Those effects have been ringing alarm bells in Israel for years and they constitute the principle message of the film. By interviewing six former heads of the Shin Bet, Moreh strives to take this debate to a new level. Not only has he wheeled out some big guns, but he is prepared to use some loaded language as well: Avraham Shalom (career Shin Bet man, head of the agency from 1980 to 1986, pardoned by his political masters for ordering the extra-judicial execution of two Palestinian bus hijackers in 1983) tells Moreh that Israel’s military has become “a brutal occupation force” and that Israel is treating the Palestinians in a manner similar to how the Germans treated the Dutch, Poles and others they occupied in World War II. For many viewers the comparison will shock, and that is the point. It has to be said that throwing the ‘Nazi’ label around is not an uncommon tactic of Israeli political rhetoric, albeit an extreme one. Still, I suspect few who see the film will be shocked by the comparison to German occupation than one might expect, simply because The Gatekeepers prepares us almost too well for this conclusion. Using the interviews, extensive archival and drone footage, re-enactments, and still-photo diorama techniques, Moreh portrays a Shin Bet intelligence system so comprehensive, so intrusive and so long-lasting that by the time we reached the Shalom comparison to German occupation I was already reminded of a more recent Germany, an authoritarian one founded on Stasi secret service control (constant surveillance, pervasive use of informants, hundreds of thousands of arrests, targeted killing, etc). Moreh is good at what he does and the film is both slick and well-paced. The recreations and drone-view sequences were a bit too reminiscent of computer game graphics for my liking, but I suspect that this was intentional, an attempt to create for the viewer a facsimile of the Israeli security establishment’s perspective on the violence of the occupation. As a description of occupation, the film is one-sided and it is the stronger film for it. Hanging in the air around this perspective is the proverbial slippery moral slope upon which the security services rest. Watching this film it is hard not to conclude that, for each of the men interviewed, a favourable narrative is apparently all that keeps them from sliding down from their high ground as defenders of Israelis against Palestinian violence, into the ignominy of war crimes. But on the question of individual morality, Moreh leaves them with their own ghosts. Instead, Moreh aims higher. The sheer historical breadth of the experience these men represent, and the central role they have played in that history, makes it possible for Moreh to dwell on a larger moral significance and create a counter-point to the Israeli self-understanding about the moral nature of their own use of force, what his subjects would call ‘purity of arms’. What The Gatekeepers does exceptionally well is drive home the interrelationship between these two dynamics - repression and its corrupting effects on the Israeli body politic. Israelis do not like to air their dirty security laundry in front of an international public. The fact that successive Shin Bet top guns all agreed to be interviewed (some for the first time; others are known to be more media friendly, to put it politely) speaks volumes about how alarmed they are about the trajectory of Israeli democracy. Israel is in real trouble, the film says, take their word for it. For the chorus of Gatekeepers who make up the bulk of this film, the culprits in this story of the corruption of Israeli democracy are clear: the religious-nationalist right wing settler movement and their political supporters, most notably Prime Minister Benjamin Netanyahu (former PM Ehud Barak is also named). Indeed, the film places Netanyahu and his supporters in the settler movement - or rather the settler movement and their supporters amongst Israel’s political elite - at the centre of its analysis of why Israel finds itself incapable of repairing its politics and making a deal with Palestinians. The basic point is that while Hamas and Islamic Jihad represent a threat to the lives of Israelis, the settler movement and their political allies are a threat to Israeli democracy. The film makes the argument that Israel's woes are a direct result of the willingness of the far right to use selective political violence (and, yes, terror) against Palestinians and fellow Israelis. The archetypal manifestation of this internal violence is the 1995 assassination of then Prime Minister Yitzhak Rabin by a lone adherent of the radical right wing in Israel. Rabin played a pivotal role in the political pact that made the Oslo accords possible. For the men at the top of Israel’s security apparatus, his assassination represented Israel’s ‘Kennedy moment’, the embodiment of the tragedy of what might have been. We are left with the clear sense that, in terms of Israeli political leadership, it has been all down hill since his death. And for that they blame the right. This particular death-of-Israeli-democracy-foretold has been heard for many years on the Israeli centre-left. It is telling that it now resounds with those who by all rights should own the security state they have built. Which begs the question: if they don’t own it, then who does?